1961 Topps Football expanded to accommodate players from both the National Football League and the upstart American Football League, which had only begun play the previous season. The set checklist boasts 198 total cards, three of which are checklists. Cards measure the standard, 2-1/2 by 3-1/2 inches. The set is anchored by a bevy of future Hall of Fame players including Johnny Unitas (#1), Bart Starr (#39), Y.A. Title (#58) and Jim Brown (#71), to name a few. The set also contains key rookies of Don Maynard (#150), Jim Otto (#182), Tom Flores (#186), John Brodie (#59) and Henry Jordan (#45). 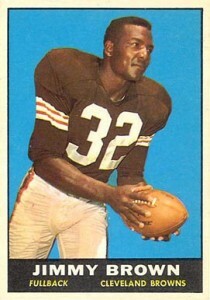 Other rookies include Boyd Dowler (#43), Johnny Robinson (#139), Art Powell (#151) and Lionel Taylor (#190). 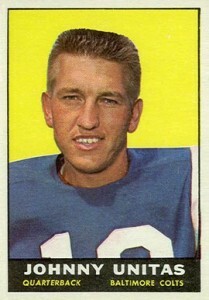 1961 Topps Football card fronts feature a player photo in either a close-up head shot or a posed action picture. The player is superimposed over a solid-colored background. A black box at the bottom of the card, includes the player's name, position and team. A white border surrounds the card. The cards vary between a vertical and horizontal orientation. The backs of the cards are once again split into two parts. In the upper left-hand corner, the card number is displayed. It is followed by the player's name, position and team. A few lines of vital statistics appear between two thin lines. What appears below that depends on the player. Some have a box with year and lifetime statistics, while others have a short biographical write-up. The rest of the card features a cartoon that had to be scratched off to see. 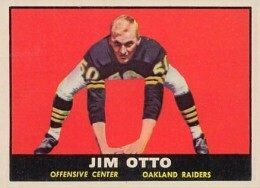 Each NFL team is featured on a team card that has a team photograph surrounded by a gridiron design that resembles the markings on a football field. There are also cards that capture highlights from the 1960 season scattered throughout the set, however these only apply to the NFL teams. The numbering sequence of the cards is once again, as the previous year, arranged by team. The quarterbacks are first, then the running backs and others. The team card appears numerically after the last player from each NFL team, with a highlight card, when applicable, following that. The only exception to the rule is card #132, which features Milt Stock of the Cleveland Browns but follows the Redskins numerically. 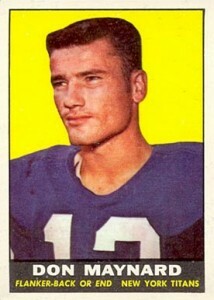 1961 Topps Football was released in two series. 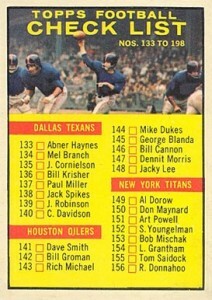 NFL teams comprised card numbers 1-132, while AFL players were printed in the second series with card numbers 133-197. The AFL players are slightly more difficult to find and star players do command a slight premium, particularly card #166, belonging to Jack Kemp. The most common distribution was in the form of one-cent and five-cent wax packs. A textured team sticker was also included in each wax pack. There are forty-eight total stickers with 15 belonging to NFL teams, nine to AFL teams and 24 to college teams. There are also 12 team stickers that have two different variations, nine AFL teams and three college teams. A small handful of uncorrected error cards have been identified within the 1961 set. Some of the more notable ones relate to the misspelling of names. The letter "c" is omitted from Tom Franckhauser's last name on card #27, Charley Conerly's is misspelled "Charlie" on card #94 and Sonny Jurgensen's name is also mispelled "Jurgenson" on card #95. Many vintage hobbyists debate whether or not the cards featuring Houston Oiler players should be considered errors as they are all pictured wearing pink uniforms. Common condition issues impacting the 1961 Topps Football card set include chipping on the blue-border on the back of the cards. The solid color background on the card front is also susceptible to flaws including print dots.